Earth Week Vendor Call Out! Are you a local business? Do you offer locally sourced, organic, vegan, or gluten free products? Are your products hand crafted or unique? Do you offer something that meets ALL of the above? We would love to consider you for our Sustainable Festival on April 19th from 10 am to 2 pm. 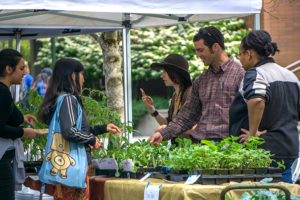 We are having local companies exhibit their wares, look for volunteers, and advertise their sustainability-minded organizations as a part of a farmer’s market and tabling event. This is a part of Bellevue College’s 4 day Earth Week from April 19-22, which ends on Earth Day! If you would like to be a part of the Bellevue College Sustainable Festival or offer something else for Earth Week, we would love to hear from you. Please contact sustainability@bellevuecollege.edu ASAP.